Golden Skyline offers two levels of care as well as three styles of rooms in order to provide the residents level of care requirement as well as the meet the style and needs of the resident. 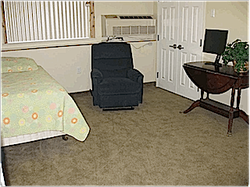 Each room is equipped with individual temperature controls to insure the comfort of individual resident. 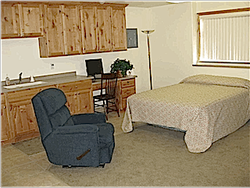 A suite room has approximately 200 square feet of living space including closet space and a private 1/2 bathroom. A kitchenette has approximately 270 square feet of living space at includes kitchen cabinetry, granite counter-top with sink, refrigerator, and micro-wave oven, as well as 3/4 private bathrooms with walk-in shower. Some rooms can provide double occupancy. The deluxe suite room has approximately 240 square feet of living space that includes closet space as well as either a private half or full bathroom. 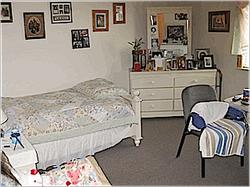 Some rooms can provide double occupancy.